Airload’s pneumatic conveying Pumps are designed for handling heavily laden sludge’s and slurries normally considered impossible with conventional pumps. 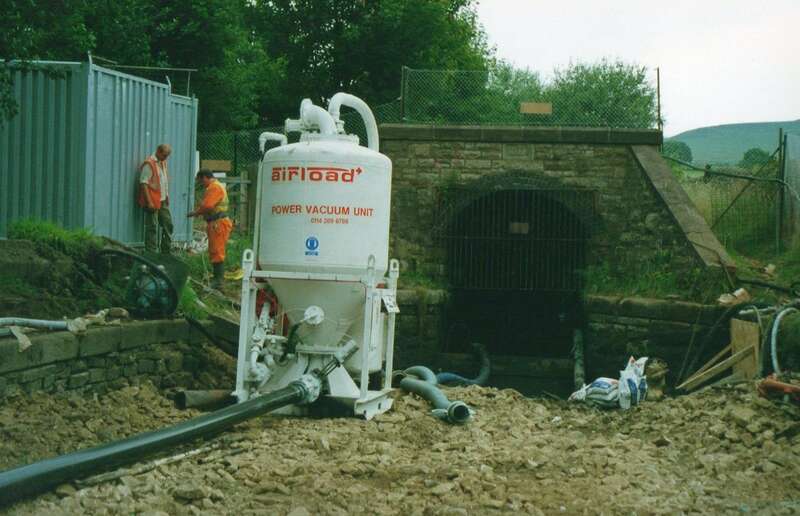 The Airload (300) is a portable compressed air powered unit, intrinsically safe and low in height making it particularly suitable for applications in underground mining and tunnelling. It can pass solids up to 50mm in lump size. Unlike conventional pumps, which rely on vacuum displacement, the Airload 300 generates a high velocity suction airflow (17cu.mtr.min./600cfm.) combined with a powerful vacuum (-0.88 Bar/26″HG.) resulting in very effective suction performance. This enables the thickest and most viscous of materials to be suction loaded with horizontal distances in excess of 100 mtrs. and vertical suction lifts of up to 35mtrs. being achievable. PERFORMANCE – With no moving parts in contact with the material, large lump solids inclusions, waxy, fibrous and abrasive materials may be moved. Performance is dependant on the type of material being handled, the suction lift and the length of the discharge run. Flow-able slurries are recovered at a higher rate than viscous sludge’s. APPLICATIONS – Safe to use in hazardous areas, or in confined locations. where material wastes must be removed. Typical uses include: – sump cleaning, face slurry removal, pump lodge de-silting, winding shaft sump cleaning, tank cleaning, sewer cleaning, mining services, culvert cleaning and pond de-silting. Airload’s gravity discharge pumps is the same as the 300 model but with gravity discharge function for applications where pressure discharge is not needed. The most powerful unit designed specifically for heavy bituminous product, sand and rust laden crude. Particularly good for tank farm and lagoon jobs. Will load solid material, capable of very high vertical suction lifts. Airload Pumps are designed for handling heavily laden solids, slurries and sludge’s normally considered impossible with conventional pumps. The Airload 2,500 is a portable, compressed air powered unit, totally ‘intrinsically safe’ and capable of passing solids up to 110mm in lump size. Unlike conventional pumps, which rely on vacuum displacement, the Airload 2,500 generates a high velocity suction airflow (25cu.mtr.min./750cfm.) combined with a powerful vacuum (-0.85 Bar/25″Hg.) resulting in an aggressive suction performance. This enables the thickest and most viscous of materials to be loaded with horizontal distances in excess of 70 mtrs. and vertical suction lifts in excess of 30mtrs. being achievable. Material is discharged from the pumping vessel by compressed air with transport distances over 150 mtrs. horizontally and heads of up to 60 mtrs. easily achieved even with high solids content. 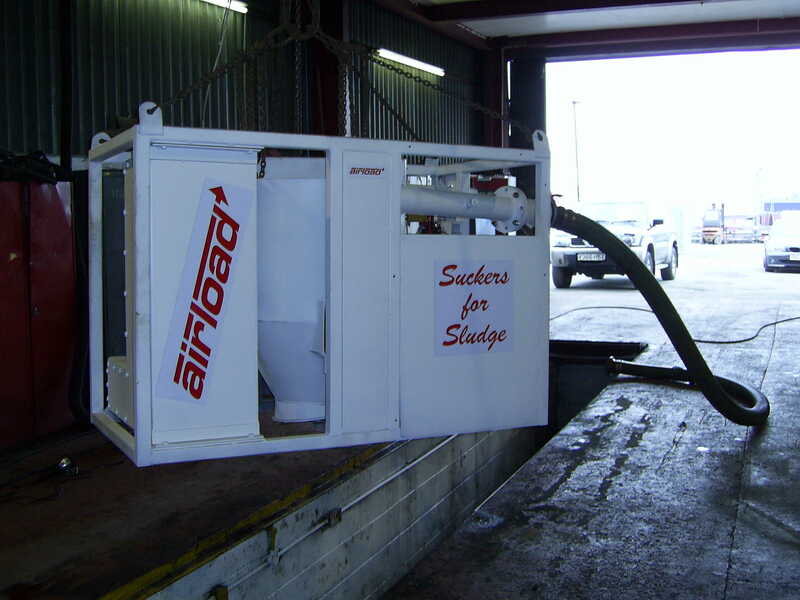 Airload has provided solutions in Sludge, Solids & Powder handling since 1989, We were the manufactures of the original A300, A800, A900, supervac pneumatic conveying units.